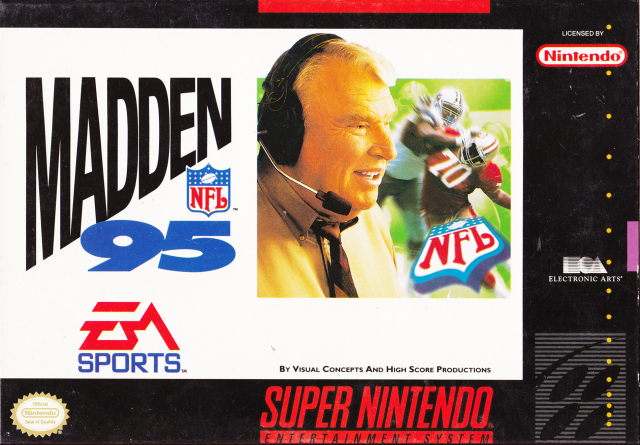 Madden NFL 95 SNES Super Nintendo Game Cartridge Cleaned Tested and Guaranteed to Work! ACTION! Ultra-competitive computer opponent. New 3-D rendered player moves; straight arms, high steppin', QB slides. Bigger field DEPTH! Complete 1994 NFLPA rosters. 48 player rosters - sub any player in any formation. Over 100 player injuries. Full NFL season, Playoffs and Super Bowl. 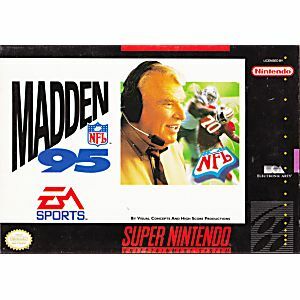 28 NFL and All Madden teams. STRATEGY! Windowless passing option forces QBs to read zone or man coverages. All-new Madden-designed defenses. Best play calling logic ever - based on '94-'95 NFL strategies! Fun throwback game to play with friends. Instantly brought back memories. I bought this game recently. I like it. The only thing missing is players names on the rosters.